Race Against time (UK) was a Nottingham-based NWOBHM band of late David G. Halliday, later known as the frontman of the band Hell. Some of Race Against Time material was used later in Hell. 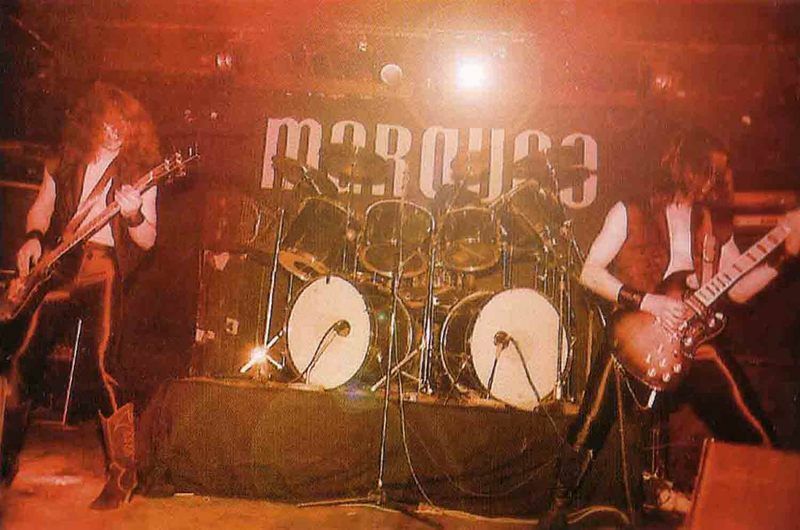 A demo was released in 1980 and there are several other songs yet unreleased.Vocals and Guitars: David Halliday (R.I.P. 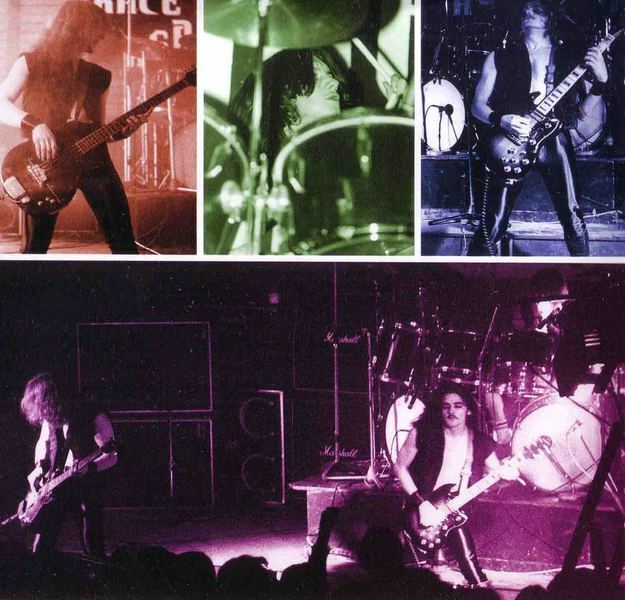 1987) , Bass: Al Short , Drums: Geoff Green.Race Against Time started in the spring of 2002 with Josh from ROI moving back to Houston and feeling the need to thrash. He recruited Dave from PLF on guitar and Ben the original bassist of ROI (who served as the vocalist on the last recording Sick Abuse ever did) on bass. A few weeks later he got Turner ( the bassist from Sick Abuse ) to join as vocalist. This was the first line up. A while after recording a demo of poor quality at Static House in Houston Ben Left the band for reasons unknown, replaced by Beau, who joined on bass before the recording of the “Depths of the Ant Bed” ep , recorded at Johnny Killed Rock’ n’ Roll studios. This was the second line up. Later, Justin (guitarist from Sick Abuse) joined on as vocalist and Turner moved over to guitar . Making this the third and hopefully last line up. RAT recently rerecorded some old songs with the new line up also recorded at Johnny Killed Rock ‘n’ Roll has been released as a split 7 “ with ROI on Burrito Records. They are currently writing and recording material for a new LP. Most memorable shows played: Fang and Verbal Abuse at Fat Cat’s, DFA and Crucial Unit at Fat Cat’s, Municipal Waste and Catheter at the Dixie Tavern and Municipal Waste, ROI, and Faction Paradox at the Ark ( both shows were the same night ), Holier Than Thou and Annihilation Time at Fat Cats, Rattus, ROI, Murder Suicide Pact at Sound Idea. Riisteyt at The Red Blood Club in Dallas. MDC, Verbal Abuse at the Engine Room. Today's "N.W.O.B.H.M. Wednesday" coverage of Race Against Time is long-overdue. But then again, so is this compilation. "Why?" you might ask be asking. The answer to that question is quite simple. 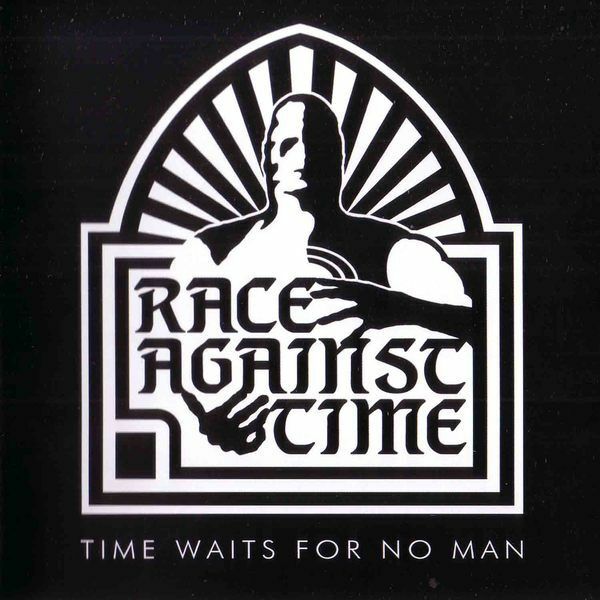 Before there was Hell there was Race Against Time. And as for the one time leader of both of these bands? Well, that would be the late great Dave Halliday. This well-assembled compilation helps to serve as another good reminder of the legacy that this one of a kind front-man left behind and while this N.W.O.B.H.M. band might not be as well known as Hell is they are nonetheless just as important! Formed out of the ashes of two club bands (Captain Hippo and Heavy Water), Race Against Time hailed from Chesterfield/Matlock and was rounded out by Al Short (bass, keyboards, vocals) and Geoff Green (drums, percussion, vocals). With gnarly lead singer Dave Halliday taking care of the guitar duties, Race Against Time created a sound that was all at once metallic and melancholy (check out "Bleed You Dry"). It's also somewhat menacing so when you find out that Hell later re-used Race Against Time material it makes sense. Style-wise and vibe-wise you could draw a straight line between Race Against Time and Hell. The fact that they were both bands to which David Halliday belonged only strengthens the sound argument, but even without that tremendous voice connecting them there is more than enough here for Hell fans to appreciate. Speaking of connections, Race Against Time and Hell were also a part of the "East Midlands Band Co-Operative" and so were Paralex and Radium. In essence The "East Midlands Band Co-Operative" was a good way for these four bands to look out for each other. And considering the state of the N.W.O.B.H.M. scene back then (in essence it was crazy swamped with every new band trying to out-due the next one!) it was a wise decision to band together in this way and potentially help each other. Or at least it ended up helping the bands Paralex, Radium and Hell as all three bands were all able to release vinyl singles. Sadly Race Against Time found themselves staring in on that party from the outside with the closing door slowly but surely putting an end to this English band. While they were still together though, Race Against Time managed to have to their well-received song "Bedtime" placed on the excellent "New Electric Warriors" compilation and they put out cassette tape entitled "Demo 1980"! "Bedtime" alone is worth the cost of admission and it's only one of the great songs that make up this excellent compilation CD! 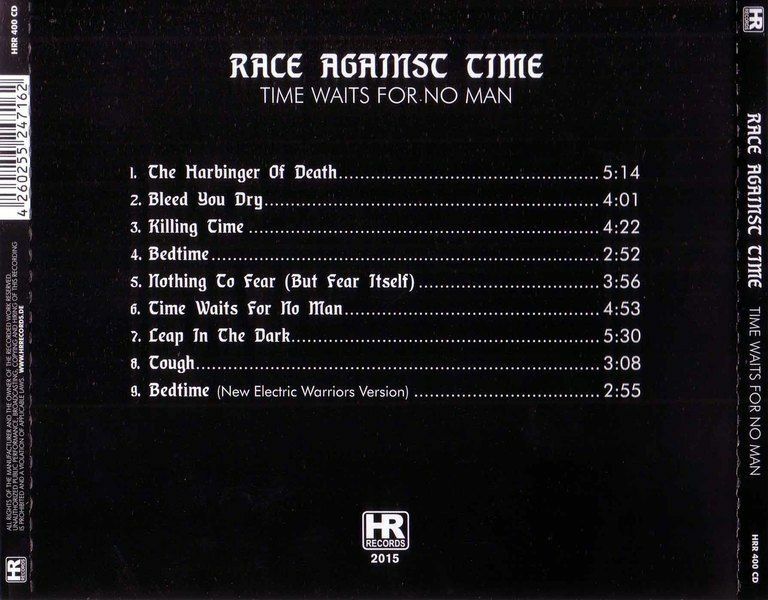 Just like it did on the "New Electric Warriors" compilation this rather cool number closes "Time Waits For No Man" in style, but not before we're treated to the demo's three tracks, "The Harbinger Of Death", "Bleed You Dry" and a different version of "Bedtime"! Interestingly enough the song "Bedtime" was supposed to be released as a single, but (long story short) after finding themselves out of a deal at the last moment it ended up being released as part of the demo. And the demo was supposed to be an officially-released EP with "Harbinger Of Death" and "Bleed You Dry" serving as the other two songs. When that didn't happen it became a demo release. Either way these three songs are quite good in their own right and had the EP been a reality maybe Race Against Time would have ended up being held in the same high regard as Hell? It's a interesting thought and it does make you play the "What If" game. But anyway, in-between these various tracks you'll enjoy the instrumental cuts "Killing Time" and "Time Waits For No Man" as well as "Nothing To Fear (But Fear Itself)", "Leap In The Dark" and "Tough". "Nothing To Fear (But Fear Itself)" was apparently intended for another EP release while all three of these numbers ("Nothing To Fear (But Fear Itself)", "Leap In The Dark" and "Tough") come from old studio sessions. According to bassist Al Short the album's two instrumentals were "pretty much jammed live at the end of one of the sessions", but all things considered they sound perfectly fine!Of course all of the material on this Andy Sneap-complied collection sound fine so please don't let the idea that these were "demo" recordings persuade you from picking up "Time Waits For No Man"! If you're a fan of Race Against Time, Hell, or David Halliday then this fine collection ends up being a must-have! But, even if you are just a casual fan of the whole N.W.O.B.H.M. scene there is still plenty to love about this compilation. Not only do you get two different versions of the excellent "Bedtime", but cool metal numbers like "Harbinger Of Death", "Nothing To Fear (But Fear Itself)" (love the wicked vocal work of Dave here!) , "Leap In The Dark" and "Tough". This loving tribute to Dave Halliday is also a loving tribute to N.W.O.B.H.M. sound of old and too good to pass up! Snag and bag it while you can friends!